Lunchtime. It’s easily my least favorite time of day. I’ve got my breakfast options down to a science, but even as a homeschooling, work from home mom, I find I’m very rushed around lunchtime. My kids are easy and rotate between the same three or so meals, but they aren’t exactly what my body needs. But then again, I’m sure picking at their leftovers or just grabbing a banana aren’t quite right either. I love shakes when I get a chance, but I’m not usually willing to run the blender when the baby is sleeping! So what’s a mom to do? I mean, I usually have about 30 minutes to get from laying the twins down, fix myself something to eat, start a movie for the bigs and plop back down in my office for a conference call, editing session, or what have you. I need something quick, healthy, and filling enough to get me through to dinner. Oh, and my husband needs something to take to work for lunch, too. See my issue? I spent the whole of 2014 ignoring lunch, and wondering why I felt so drained come 3pm. And starving. And likely to grab the first thing my hand finds (like hubby’s candy bar stash in the freezer). *shame face* So in 2015, I am taking better care of myself, that whole “New Year, New You” motto. Yes, I can do this. And these don’t have to be huge changes, just small things, like feeding my body what it needs to thrive. So, back to lunch options. We all know we need protein. But let’s face it, we’re getting a little old for peanut butter and jelly sandwiches (at least, not every day, okay?). Eggs are my go to for breakfast, but I wanted a little something different for lunch. Tuna. We love it (especially Bumble Bee®) as it is an easy and delicious way to add a variety of nutrients to our diet, including lean protein, healthy fat, and important vitamins and minerals. Oh, and bonus, their products come in a pouch which makes it easy to take for lunches on the go. No can openers to deal with! Anyone else grow up eating boring ol’ tuna salad sandwiches? Tuna, mayo, salt and pepper, all on a slice of bread. It gets old, and then we try to find ways to spice it up…paprika, hard boiled eggs, and maybe a little pickle relish. But let’s face it, at that point, the health aspect might be negligible depending on the amount of mayo we’ve got in it. 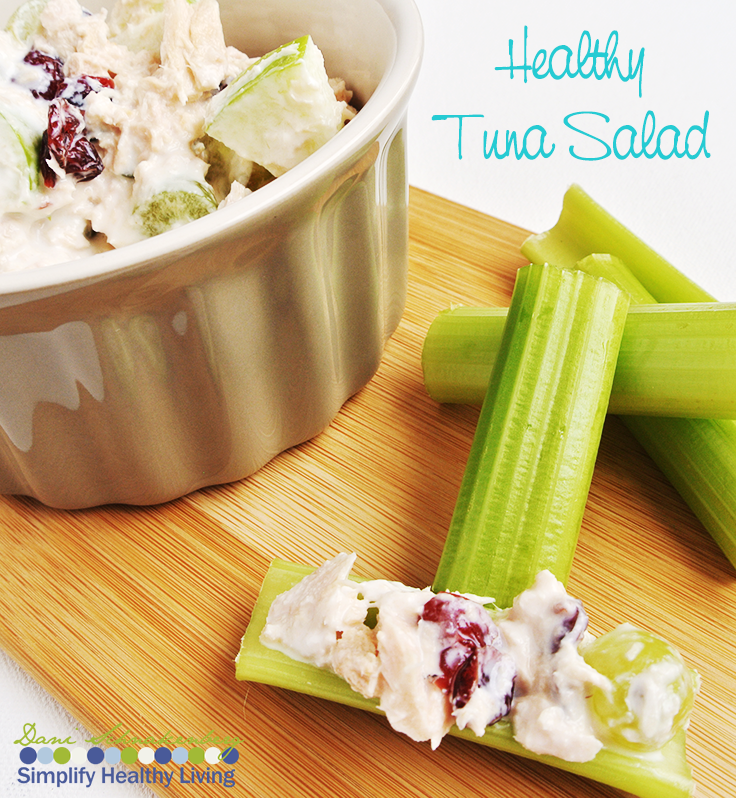 So how about this fresh spin on tuna salad? 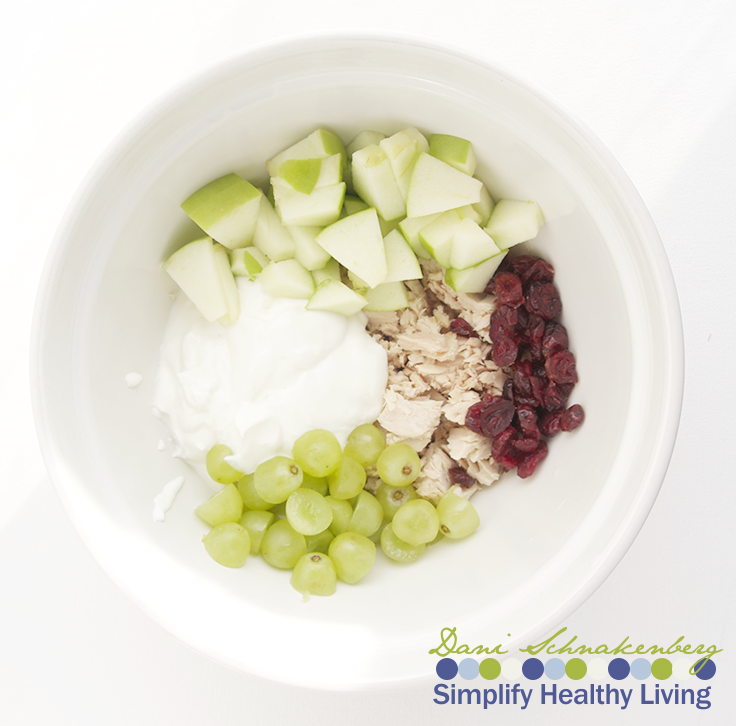 Green apple, dried cranberries, grapes, greek yogurt, and a bit of lemon juice. Eat it with a fork on a bed of lettuce, toss it in some flatbread and make a wrap, or even eat it on celery like I did (seriously, that crunch!). 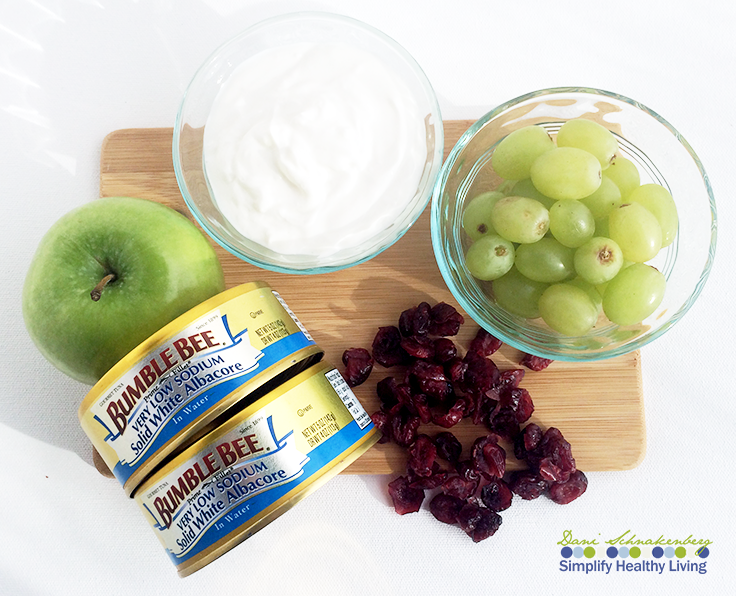 Share your favorite Bumble Bee® tuna recipe in the comments below! I just took a can of tuna out of the cabinet as I’ve been wanting tuna lately! This recipe looks awesome, I’m going to make it tonight ;). Sounds delicious. I can’t wait to make it. Thanks for sharing! This sounds amazing. Better than the plan old tuna salad. Plus it’s healthy, so even better! This looks so great! I am putting it on the menu! Yum! This recipe looks delicious! We don’t use Bumblebee, but I am sure any tuna would work with the recipe…mine just won’t look as white. Can’t wait to try this, thanks for sharing the recipe!